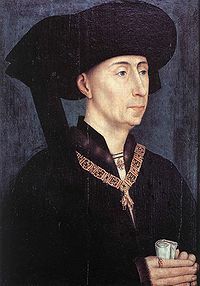 On 10 January 1430, during the marriage celebration for Duke Philip the Good and his third wife, Princess Isabella of Portugal, the Herald of Flanders announced to the assembled guests that his master, His Most Serene and Powerful Prince and Lord, the Duke of Burgundy, Count of Flanders and Artois, and Palgrave of Namur, had founded a new order, the Order of the Golden Fleece. Isabella's mother was the grand daughter of Edward III of England, who had founded the Order of the Garter. 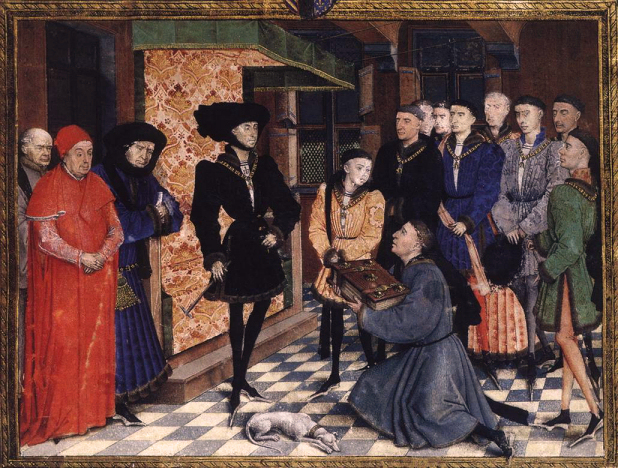 The first ceremonial meeting of the Order of the Golden Fleece occurred on 30 November 30 1431, on the feast day of the Apostle Andrew, patron saint of the House of Burgundy and now of the new Order. At that time, the regulations of the new Order were acknowledged in the presence of the Duke and the first 24 knights nominated by him. The principal aims of the Order were to promote the glory of God and to defend the Christian faith. Philip the Good combined aspects of the Greek myth of Jason and the Quest for the Golden Fleece with the Biblical story of Gideon in the Book of Judges (6:28-40) to lay a solid spiritual foundation for the Order. The outstanding artisans of the day created elaborate and exquisite robes and collars for members to wear at chapter meetings and festive occasions. The Order of the Golden Fleece was intended as a knightly brotherhood and a friendly alliance of noblemen. On admission into the Order, the new knight laid one hand on the Gospel, the other on the Cross of Allegiance, which contained a particle of the True Cross, and swore to abide by the statues of the Order. He then received the neck chain of the Order around his neck. On festive occasion members of the Order were permitted to wear the magnificent robes of the Order which had been crafted in bright red, white or black, according to the event. Membership was experienced as a strong, holy bond by which one pledged loyalty to the sovereign of the Order. Probably one of the reasons that Duke Philip conceived the Order was political, creating a band of extremely faithful nobleman loyal to himself and his dynasty. In the beginning, those who received the honour of membership were the highest-ranking nobles of the realm. Thus the Order of the Golden Fleece outshone all other orders with its wealth, standing, and splendour of the Burgundian dukes. 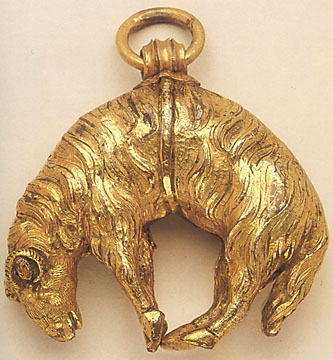 The Order of the Golden Fleece claimed pride of place among all the Christian orders, and later when the Hapsburgs of Austria acquired all the Spanish property and titles they consolidated this position with even grander accouterments to accompany the bestowal of membership in this extremely selective Order. With the passage of time and the transfer of realms from house to house for variety of reasons, the Treasury of the Order was eventually evacuated from Brussels under pressure from the French Revolutionary army in 1797 along with the liturgical vestments. Some of these treasures are in the Imperial Art treasure museum in Vienna, Austria. In viewing these beautifully crafted treasures today and having the eye of history, one can understand the pride and honour a recipient would have. And knowing the intrigue and political machinations of that day, one can envision how a recipient would take great care to make his opponents aware of his stature with the Emperor.